Here's a bicycle that Cycle Chic has been riding around on for a few weeks. 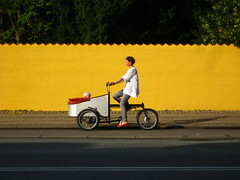 It's fun to test drive new bicycles in the ongoing search for cool urban transport. It's an ocean out there, filled with schools of groovy rides. Taking a bike for a test drive is great, but I don't think you really get a sense of the bicycle by staring at it intently and riding it around the block or on a parking lot or at a bike fair. The best way to test drive a bicycle is to use it for a longer period. A short test drive places all your focus on the bicycle and is a bit nerdy. Because it's not about the bicycle. It's about you on the bicycle. 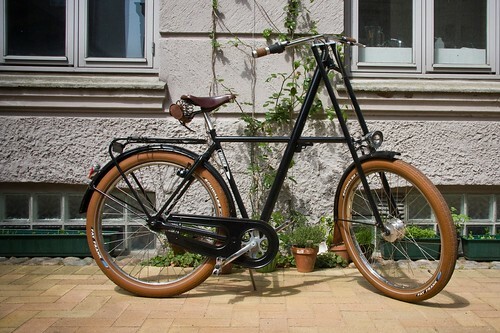 So here at Cycle Chic we figured we'd test drive bicycles for a longer period. In order to become comfortable with the machine and, in a way, to forget the bicycle. Once you ride a bicycle around for more than a couple of days, you don't notice it. You're looking around your city, going from A to B. Then it's possible to return to thinking about the ride. The bicycle featured here is the Velorbis Leikier. It's a co-branding effort between two Danish companies. Lars Leikier is a respected bikesmith, located here in Copenhagen. Together with his business partner he produces that proud workhorse of the Danish cargo bike fleet - the Sorte Jernhest, or Black Iron Horse. Here's a Sorte Jernhest in action in Copenhagen. 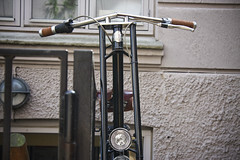 Lars Leikier is inspired by the American choppers from the 50's and 60's and the Leikier is an offshoot of this fascination. On their website it's described as a Stately City Floater [statslig byflyder]. He crafts 15-20 of these bicycles each year in his bikesmithy. Totally con amore. 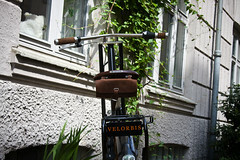 Now Leikier and classic Danish brand Velorbis have entered into a co-branding of the bicycle. Taking it to the next level. The result can be seen here. So what's it like to ride? First of all, the bicycle is a real headturner. You can't pedal anonymously through the city on this puppy. Men, women and teenagers notice it and admire it as you roll past. I've found that the description "Stately City Floater" is a perfect way to decribe riding the Velorbis Leikier. You sit grandly upon the saddle. The design makes your mother proud in the way that you're sitting up straight. I've discovered that it's virtually impossible to ride with two hands. One hand is magically drawn away from the handlebars to hang casually at my side or to glide into a pocket. You feel like a king on this bicycle. You rise up above your city and survey it from a two-wheeled perch. All desire to go fast is removed from the design - although with 8 gears you can get up to speed if you need to. It is the poster child for the Slow Bicycle Movement. And it looks bloody fantastic, too. Oh, and super easy to find in bike racks filled with hundreds of bikes. It's the tallest bike around. I like it when you ride a bicycle and just kind of forget about but somewhere, somehow you just feel good on it. 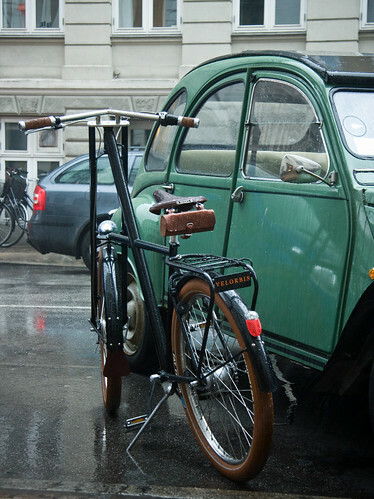 If you notice your bicycle too much, it's not necessarily a good thing. It's like holding hands with someone you fancy. It should be natural. You should know exactly how you both like to hold hands and when your fingers intertwine it should feel nice for a moment and then just become natural. During the Velo-City Conference 2010 I loaned the Velorbis Leikier to my friend Joel, from Ottawa. A good choice. He dressed for the bicycle. - The Velorbis Leikier is available from Velorbis - www.velorbis.com. - It retails for 10,000 kroner - $2995 in the States. There are only 15-20 of them hand-made each year at the moment. - They come in two colours; black and silver. The verdict? Cycle Chic approves. Weee doggie, that looks a stunner. Come into my stable little Leikier, I have a stall waiting for you. You don't see so many old Citroen cars like that these days. Hello! We are from Brazil and like to bicycles. congratulations on the blog. beautiful picture. 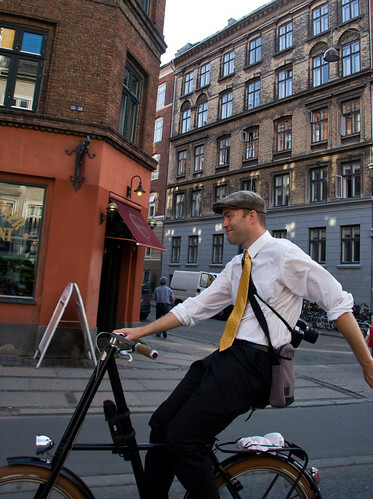 everyday i salute copenhagen for their culture on bicycle. Stunning. Looks like an excellent style for men, in particular. I see so many guys around here on cruisers meant to look like cool motorcycles, but they look like they're on toys. This--completely amazing. Applause to Joel for dressing the part. All I can say is... I want one! I've got one and it's totally awesome! I wonder if anyone else in Melbourne has one?